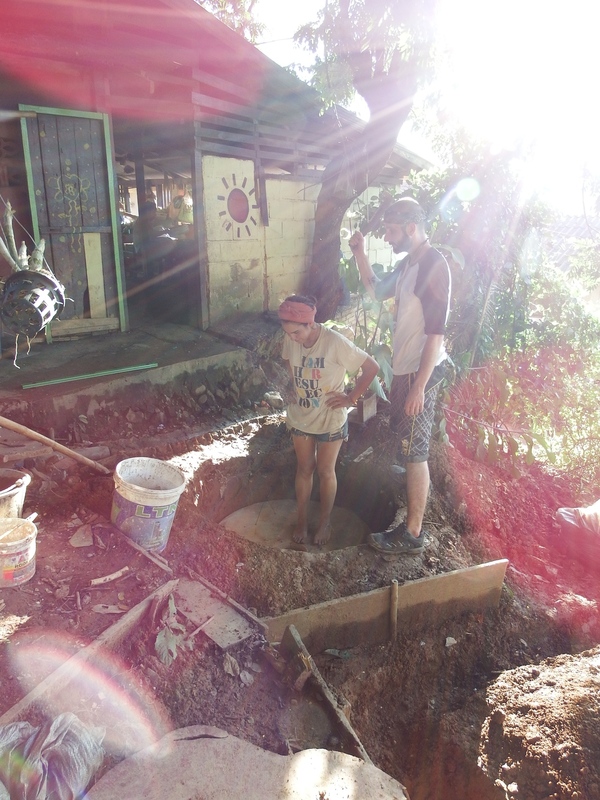 This page documents 10 days of volunteering in a small community in Northern Laos. While there are many components that are not of the week that are not represented on this webpage I have tried to illustrate enough to give a sense of the project. If you have any questions or comments please feel free to contact me. The first video is from Day 1 and introduces the place and the goal of the project. There is also a small pitch about how you can get involved in the community if you want. Kajsiab from Hayley Joyell Smith on Vimeo. At the end of the evening I was sitting around having a beer and it turns out there were two other volunteers looking to contribute to a project. The extraordinary coincidence of Ryan and Magdelena being there propelled the possibity of actually being able to complete a project. Furthermore, another interested party was there to drill us with questions and in the end offer support. Phil was there in Huey Xia for the famed Gibbon experience and would be gone but promised to come back in three days time. Day 2 was all about seeing what we were working with. A soil profile was recorded and it could be better but I suppose it could be worse. We also spoke with the folks here about other options such as a compost toilet, which is a possibility in the future. For now the goal is really to fix the current toilet. I was hopeful that a classic septic system will be suitable since there are limited supplies and resources available. I reached out to some of the experts in the wastewater field for advice and brainstorming. It was hard to convey that the standards of systems in general are not the same as we are accustom to in the West. In reality, many of the rules and regulations in place simply do not exist. medium from Hayley Joyell Smith on Vimeo. Day 3 was a bit of a detour. We went to a nearby village and looked at the water system there. Then we went around to some of the shops on the side of the road to see what resources were available. Really reminds you of how we take for granted being able to buy things like a basic pump, pipes, or a septic tank. In Laos most of the construction supplies are imported from Thailand and they are few and expensive relative to other things. I also learned a lot about the lack of sewage systems in Laos in general. For instance, according the WHO, 10 years ago the capital of the country did not even have a sewage system. About 30% of folks have a septic tank and the majority of people simply dig a hole in the ground under the house and that is where the toilet water goes. The photos to the right are random photos from the first few days. Day 4 was a big success. I was able to find some important supplies at a local market. These included rubber boots, rubber gloves, eye protection, a pick axe head, a sledge hammer head, tape measure, level and a coconut. We had to go to a special store that imports PVC pipes and fittings from Thailand. I was hoping for corrugated pipe but no go. The one thing we did not get that I really wanted was Lime, Coming back to the site with all the supplies was a big moral booster. 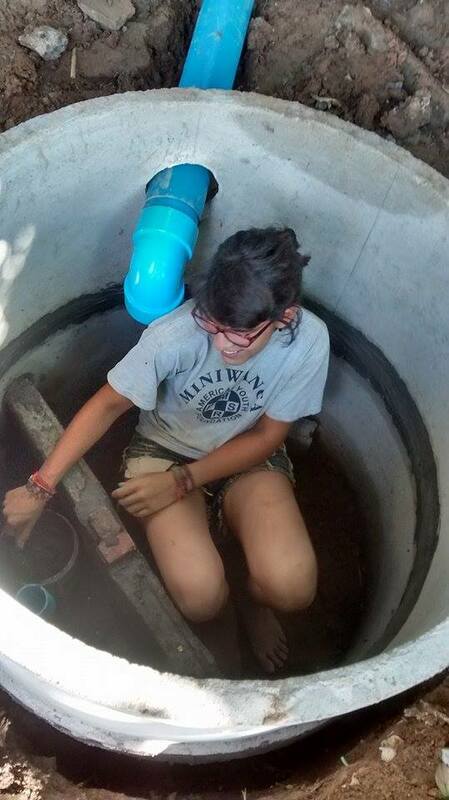 Later we went and purchased the concrete cylinders that will be the make-shift septic tank. Supplies have arrived from Hayley Joyell Smith on Vimeo. mobile from Hayley Joyell Smith on Vimeo. Day 5 was full of more trench digging and getting as much work done as possible. I have a wonderful conversation with Lara (lives here at the Daauw House) that really changed my perspective of the Hmong people and my own way of being part of the community. 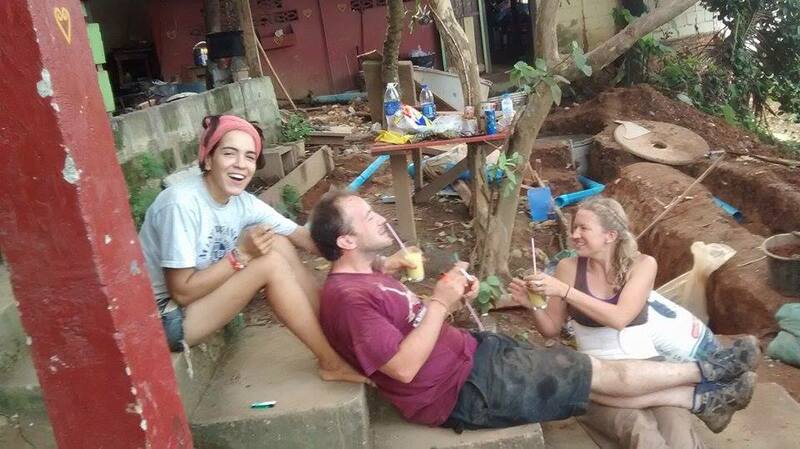 See the video below for a one-take honest reflection of volunteering here in Laos. Day 6: The end is in sight, but still a ways off. We are so happy to have Phil back with us after his gibbon experience because it adds a new enthusiasm to the group. Also, we went straight to the quarry to get the gravel. I was thrilled to have a chance to look at cool rocks. Day 7: A most satisfying day indeed. The holes in the pipes are drilled, the inspection points are installed, the baffle in the tank has begun, and sprits are high. After the children returned from school and the was lower we made set our sights to begin to fill the trench for the pipes. Within about an hour we transferred more than a half a truckload of gravel up the hill to the steps to site. 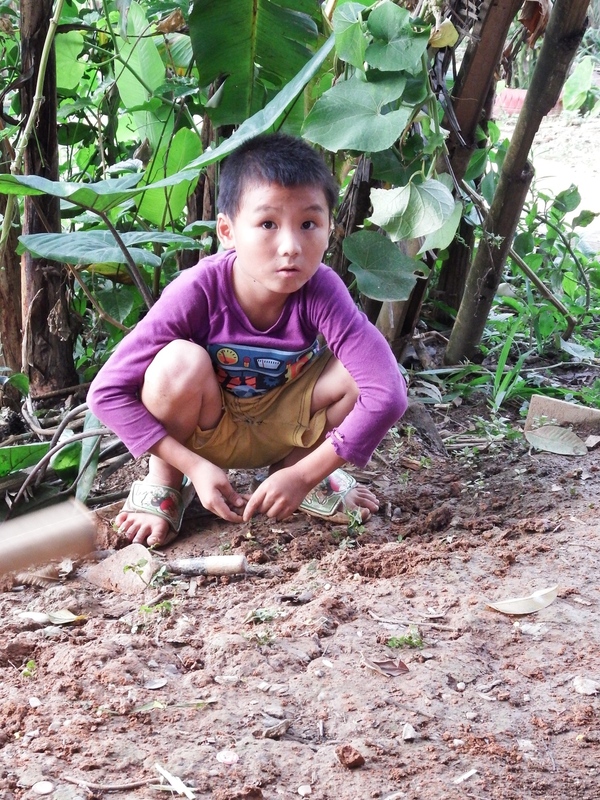 It was inspiring to watch Baauw (an 11 year old) take a stick of bamboo, make notchs and find two small buckets to carry the gravel more efficiently. Brilliant! Us four volunteers then made pizza in the wood fired oven and drank beer and talked with the community who lives here. It was a good and full day. This next bit of the documentation is about the people who are intimately involved in this one project at Kajsiae. Some of this people live her and some are just passing through but for the past week we have been together. Have learned together and from each other. We have been living life together in this space and time. Those presented here are only a few of the folks who have made it possible for us to all come together and they are in no particular order. Magdalena is a strong woman from La Plata Argentina. She has been working and traveling abroad for over a year and landed in Huey Xay a day before coming to Kajsiae. Her determination, willingness to work hard and he smarts are a crucial part of the making progress. Magdalena is good at geometry and brainstorming about how to make things work. We are pretty sure that in a past life she was a brick layer because she is so good with the concrete, chisel and likes making the septic tank. Nzoua is one of the 'parents' of Kajsiae. He is social butterfly with a purpose. In the past week he has helped transport villagers to the hospital, make plans for travel and learning a new language, connected with people staying at Duaaw house, and worked with chiefs from villages and police to allow 5 people to move away from a village to Huey Xay. I think that the thing he is most excited for right now it to see his wife and three children who have been in Holland for over a month. Seng and Baauw are the ones who keep this place a joyful home. They always manage to whip up an amazing meal for each part of the day. They clean with the grace of angels and have the hospitality that would make any guest feel welcome. 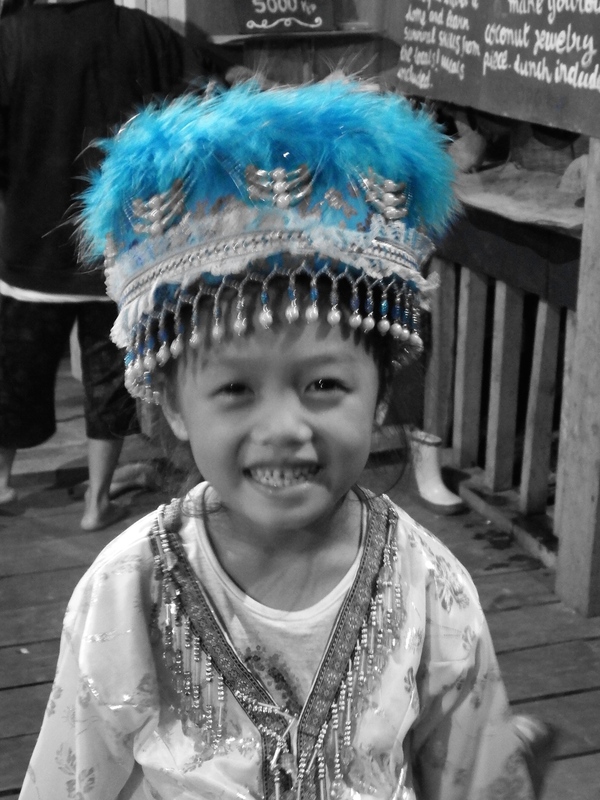 Seng is from Phonsavan, Laos. I have not learned as much about Seng because I do not speak Hmong and she does not speak much English. I had a wonderful conversation with Baauw the other night and learned that she was not allowed to go to school because she had to help with the family. She explained how she cried and begged her mom to go but was not allowed. Now, her beautiful 5 yearl old daughter goes to school here in Huey Xay. Ryan is from Glasgow, Scotland and on a journey with no planned time to return to his homeland. He came to the restaurant and learned of the volunteering opportunity and thought it would be good to do some work. Little did he know that his past work on construction sites would come in handy when building a toilet system. Ryan is steady and while he speaks of his struggles to be patient and calm I see his demeanor as grounded and flexible. And of course with a good sense of humor he keeps us laughing. We are lucky to have him. Phil is from Bristol England and recently quit his job to see more of the world and possible find a new career path. He is pretty good at whatever he sets his mind to and we were fortunate that after meeting us for only one night decided to fund the project. Even better was his quick wit, clever thinking, and energy to carry countless bags of soil and gravel up a hill to the site. By the end of the time he had made good friends with the kids and certainly earned the respect of those involved. Zjong is also one of the 'parents' at the Duaaw home. Her brother is Nzua and together they work to make sure that they can support the people who depend on them. Zjong has a sweet nature and shares her feelings and kindness by placing a hand on your shoulder or giving you a warm smile. She is working hard with keeping track of all the finances, even though it is not her favorite thing to do. While she did not tell me this in person, I would guess one of her favorite things to do is watch her baby smile, bring joy to people, and have good meals with family and friends. Yaa is a firey spirit who we wish we could communicate with more words because he is so much fun. He was very thoughtful to always invite us to go play football with him or to have a drink. He worked with us everyday and even drove us to get the gravel and supplies. Reluctant to tell us his age we eventually found out from one of the children. Yaa's knowledge of the tools and his way of work mixed with lots of breaks reminded us to not take things too seriously. Baauw is a mother here at the Daauw Home and works around the property. Most days she is helping to keep the babies happy and healthy. The little boys love to come and play in the site area and Beaw worked with them so that they could help as well but also to keep a safe distance from any of the big tools. Toward the end of the project she was hanging out more with us and seemed to soften to our being there. It was a rewarding moment when she came without the kids and gestured that she wanted to be with us for a while. The many children at the Duaaw Home create a lively atmosphere. They were all part of the experience but for the sake a space and time I will not describe each one. Please take a moment to scroll through the photos. I think they will speak more clearly than my words. Day 8: The calculations of angles, slopes, and liters per day dominated the day. A couple of the results of this fine tuning included needing to dig the trenches deeper and to shift the pipes until all was aligned. While us volunteers imagined being finished by now and moving on to other places we were determined to stay until it was completed. What an honor to work with people of such high integrity. Day 9 was a day of completing the project. At this point, with the best of our abilities, we did all we could do for the infrastructure of the septic system. This pipes were sealed, the lid was set in place, the gravel and soil was placed on top of the pipes, and as much education was conveyed as possible. We tried to trouble shoot things that could go wring and to talk with the community members about how to maintain the system. It is our hope that we have created a wastewater system that will be more sustainable than the hole in the ground. Day 10: Clean-up and beautify. Of course we don't want to leave with things a mess so we worked hard to make the area as friendly as possible. 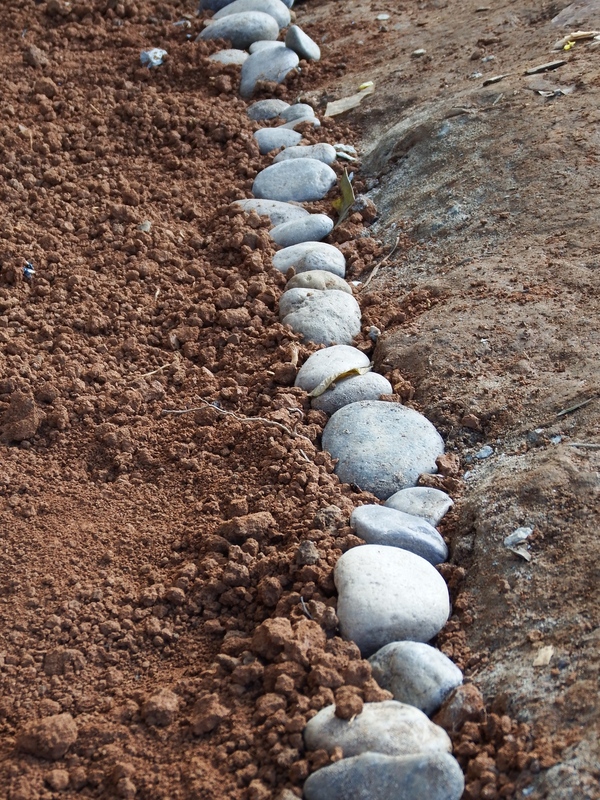 Also, to create a path and start the process of planting some plants. As dusk set in we found some paint and enjoyed putting some color on the septic tank.